A house divided against itself cannot stand." I believe this government cannot endure, permanently, half slave and half free. I do not expect the Union to be dissolved — I do not expect the house to fall — but I do expect it will cease to be divided. The House Divided Speech was an address given by Abraham Lincoln (who would later become President of the United States) on June 16, 1858, in Springfield, Illinois, upon accepting the Illinois Republican Party's nomination as that state's United States senator. 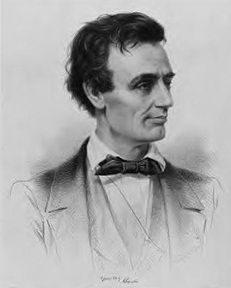 The speech became the launching point for his unsuccessful campaign for the Senate seat against Stephen A. Douglas, which included the Lincoln-Douglas debates of 1858. The speech created a lasting image of the danger of disunion because of slavery, and it rallied Republicans across the North. Along with the Gettysburg Address and his second inaugural address, this became one of the best-known speeches of his career. The speech contains the quotation "A house divided against itself cannot stand," which is taken from Matthew 12:25: "Every kingdom divided against itself is brought to desolation; and every city or house divided against itself shall not stand." Lincoln was referring to the division of the country between slave and free states. The "house divided" phrase had been used by others before. Eight years before Lincoln's speech, during the Senate debate on the Compromise of 1850, Sam Houston had proclaimed: "A nation divided against itself cannot stand."